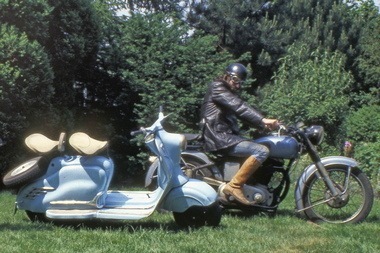 My first experiences in motoring, started in the mid-seventies, when some friends of mine bought their first mopeds and allowed me to try these noisy little bees myself. Soon, I just had to have one too and more than thirty years - and several machines later - it' s time to put some pictures and text on this ever growing World Wide Web. Sadly, I don' t have pictures of all the machines I ever owned, but names like Puch, Zundapp, Victoria, Aermacchi, Ducati, Honda, NSU, Triumph, ... may ring a bell. There were also frequently lots of bikes from friends for repair in my shed, so I think I did get some experience in taking those old thumpers back on the road again. 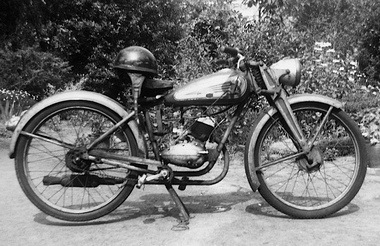 The first " motorcycle " I bought for my 17th birthday: a 1951 98cc Victoria V99 BL " FIX " - including the pudding basin helmet that came with it. This bike is owned by my brother these days. Here' s one of two Aermacchi machines I owned in the early eighties. 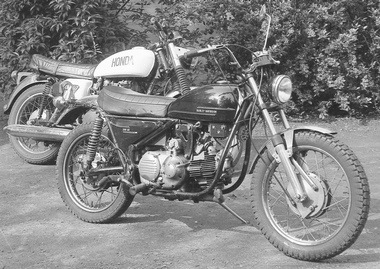 It is a 1974 350SX, while the other was a 350SS Scrambler. Fun, but pretty heavy for off-road use. In the background is a CB 450 I used for a while. One of the machines I owned and rode for a long time, was a 1976 750cc Triumph Bonneville. Lack of funds for a badly needed complete rebuild and little mileage over those last few years - plus some family expansion - was reason enough to sell the bike that had been with me for about 13 years. 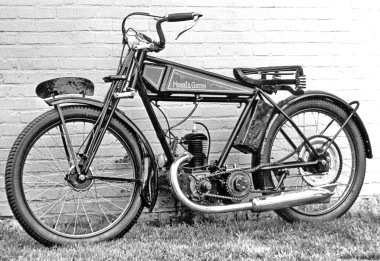 The only motorized two-wheeler left after selling the Triumph, was a little 38cc Victoria- powered bicycle in my cellar, but my motorcycling days seemed to have come to an end. Originally an export model ( small fuel tank and higher bars ), I converted this Triumph to some sort of caféracer with Duralumin fork yokes of my own design and homemade rearsets. ... 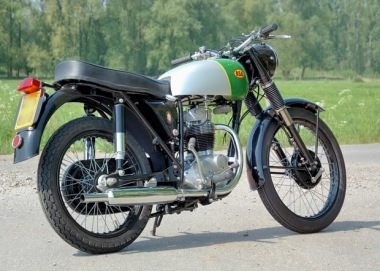 But then, almost ten years later, I was offered a very tired 1967 BSA B40 WD. For FREE ! It was in need of a total restoration and it took me almost two years to rebuild, but in April 2007, it fired up on first kick. Mmmm... my motorcycling days were NOT over yet ! 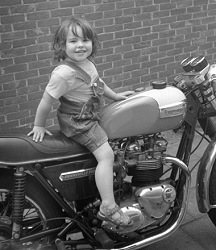 Also during 2007, I was asked to participate in the creation of a book on Belgian Motorcycles. More about that here. Below: My current mount is this ex- military ( WD stands for " War Department " ) BSA B40 WD as it is today. It is used throughout the year for the purpose it was built for: riding it.